Oxfam says small arms have killed one million people since 2001. The European Union has announced it will back demands for a global treaty regulating the sale of small arms. At a meeting in Luxembourg, EU foreign ministers issued a statement calling on all states to "join the international consensus in this area." Countries like Kenya have called for action to stop arms causing insecurity. The move was praised by aid agency Oxfam, which has campaigned alongside Amnesty International for a treaty setting global controls on small arms. "This is a massive step towards tougher international arms controls. 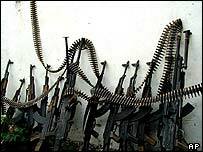 For too long the arms trade has operated without international regulation and millions of people have died as a result," said Simon Gray of Oxfam. The EU statement added that the proliferation of small arms was "undesirable and irresponsible" and said their sale undermined peace security and development. The statement said the UN was the only body that could oversee such a treaty. According to Oxfam, the EU currently accounts for 39% of global arms sales. Campaigners have accused wealthy nations of continuing to profit from the sales of arms to countries that commit violations of human rights. The United Nations is set to hold a meeting on the issue of small arms in June 2006.